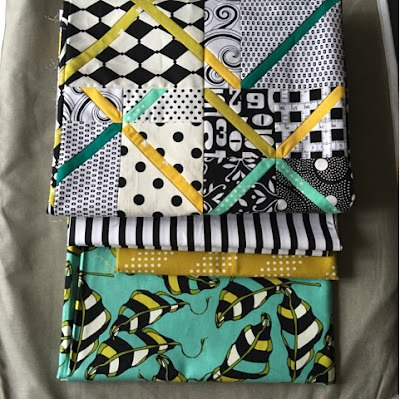 2016 Finish Along Q3 Goals included six items and these two shams (counted as one goal) was the final project to make the done list. I'm super sad about the 3 that are rolling yet again to Q4 but trying to focus on the positive and not be a glass half empty kind of quilter. I suppose they could have been considered two items but that seemed a bit like the person in the quick check line at the grocery store counting a case of beer as 24! 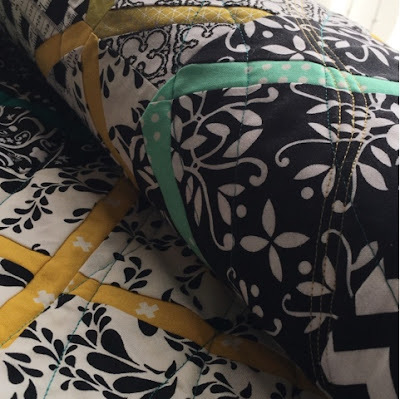 The block motif determined the width of the sham and the pillow determined the rest. 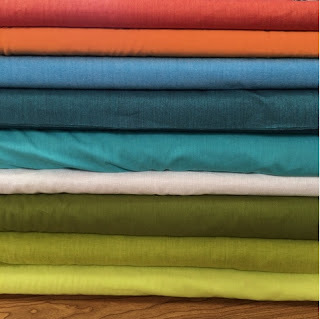 I purposely purchased extra deep fluffy ones to try and avoid having them baggy but it also meant the wrap meant loosing a bit of the design. Boxing the corners to get rid of the "ears" was a genius suggestion by a guild mate at Sew Day. 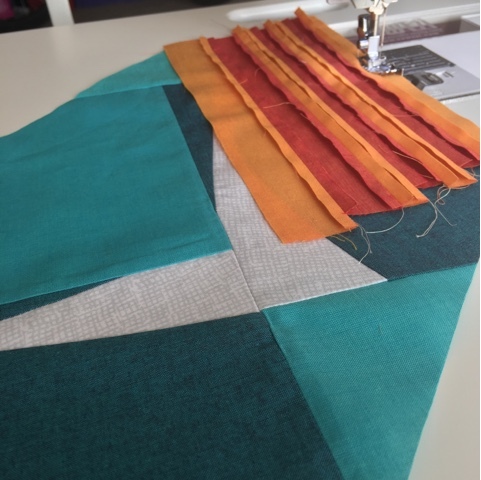 Trying to wing it with the pleat on the back to create more of a 3-D shape rather than flat sort of backfired and there was a lot of easing in and additional pleats to the back to try and get them to fit. Having to match up the stripes wasn't helpful either but after a good washing they actually were snug enough to pass the test. 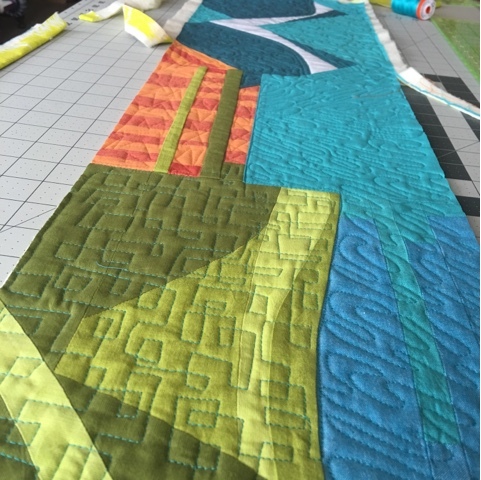 My friend offered up her long arm for the massive quilt that these go with (my other FAL goal, titled Parental Guidance) so I used the opportunity to test out the quilting and thread. Once I quilting them together as a unit, they really could have passed as a quilt. 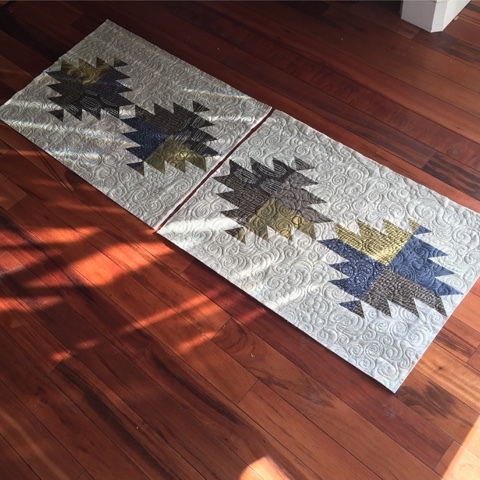 This photo with the afternoon light really shows things off and I like how the are "the same but different". 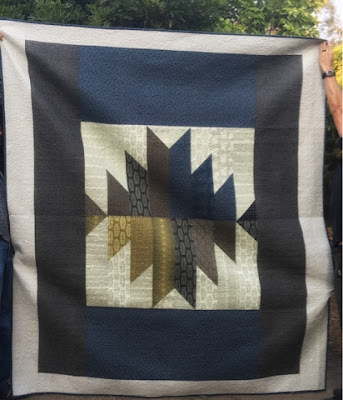 I'm very proud of my original design and feel it is in a style reminiscent to the way that I paint so I've chosen it for the Art Quilt Category. An abstract view from the beach. 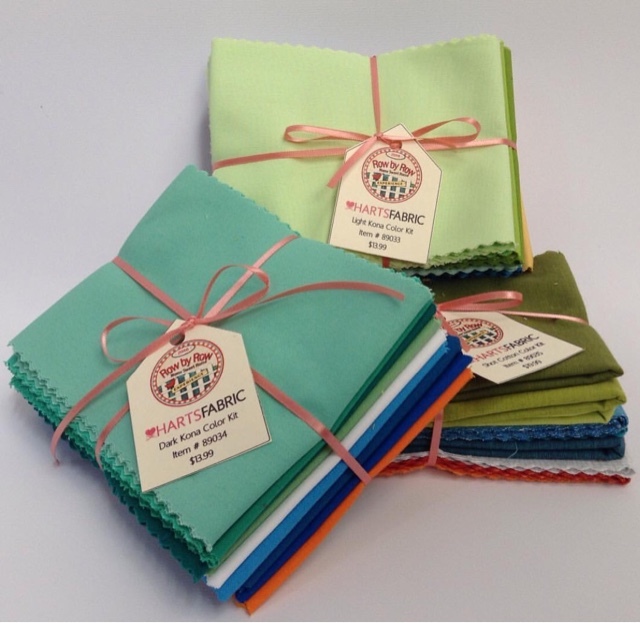 It was made for the RXR hop at Hart's Fabric. Shot cotton has such a wonderful essence and I loved working with it. 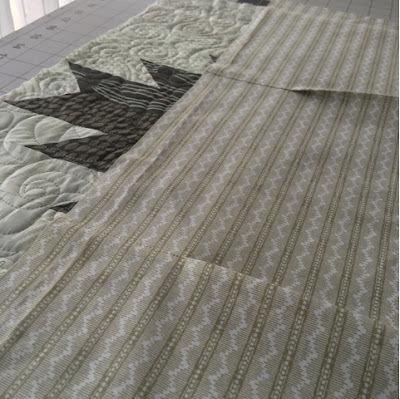 The seagull is purposefully a different fabric and not quilted to give it an extra emphasis. 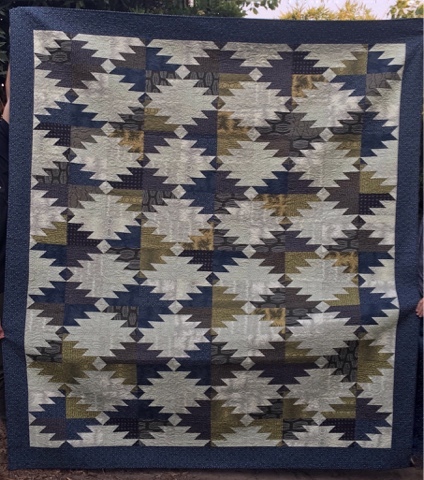 I was glad to make a third version of the quilt with shot cotton and love the subtle blue variation that looks like blended paint strokes. A change of free motion style throughout lends to the overall expressive vibe. Sewing the store samples, writing the pattern and having the design open for opinion on social media was pretty far outside my comfort zone. 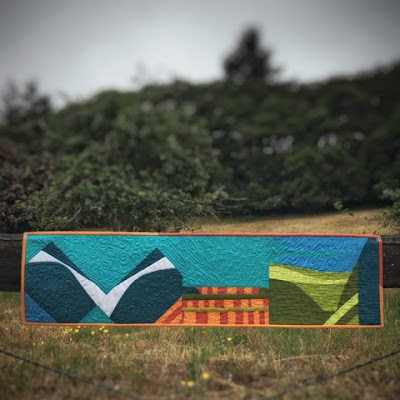 Having an abstract improv row was pretty unusual for the Row by Row Experience event come to find out and I was please with how many supportive comments it received. 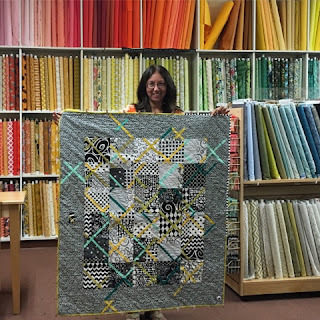 With a theme of "Home Sweet Home" it was easy to feel immediately connected to the project because after all it is located in the neighborhood where I grew up and I've been shopping there since I was a little girl. 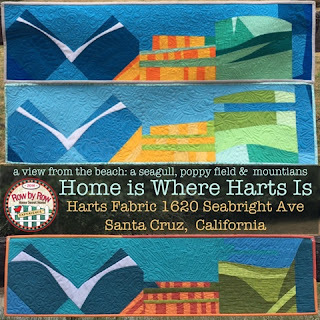 Three samples seemed fitting for the triptych inspired view from the beach depicting a Seagull in Flight, California poppy field and the Santa Cruz mountains. The design was from images in my head and memories more so than directly from specific photographs. 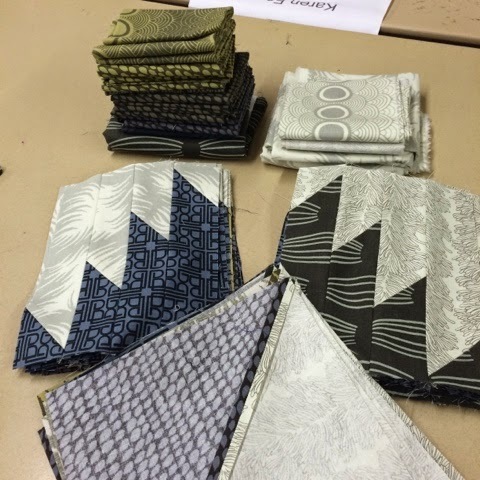 I also felt it was important to show variety so that makers would be less inclined to duplicate the exact design. 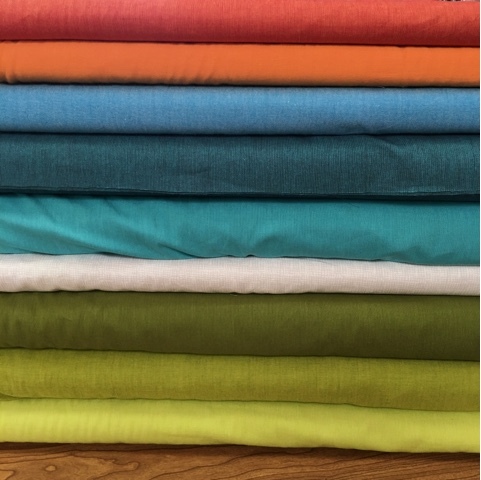 Since the store sold three different kit options: Kona light, Kona dark and Shot Cotton, it worked out well. 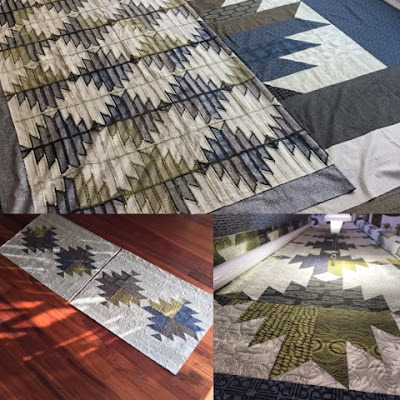 Although they are only 9"x36" each the steps to piece, quilt, bind and sleeve them all took a lot of hours! 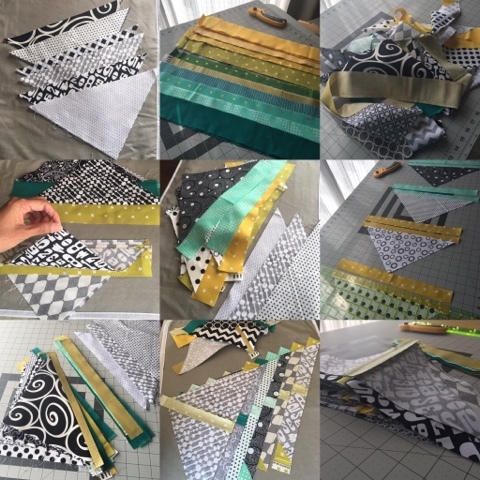 I've chosen this quilt for Blogger's Quilt Festival Small Quilt category because it was a fun technique based QAL that I enjoyed tweaking to make my own. 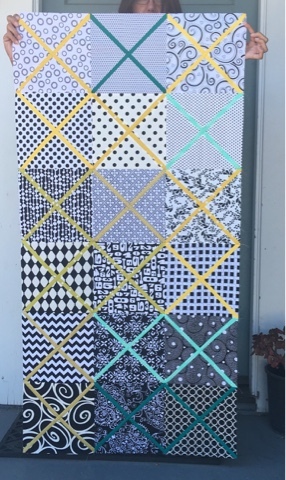 My finished #crosscutquiltalong was one of those unplanned sewing delights. I hopped on board the Quilt Along with hostess @aquilterstable and came out the other end with an actual quilt to gift instead of a typical WIP. Seeing the variety based on fabric and modifications was a real treat. 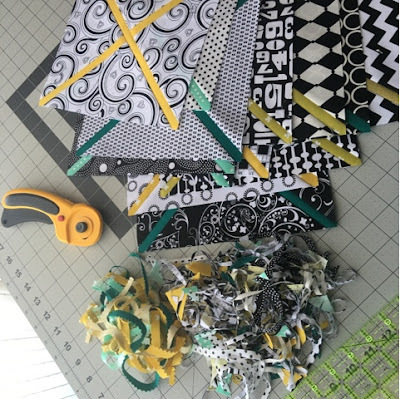 Part of the incentive was using up the Black and White 10" squares from an old Flickr swap and a Kona solid jelly roll with colors that played along nicely with a jelly roll of Cotton and Steel basics. 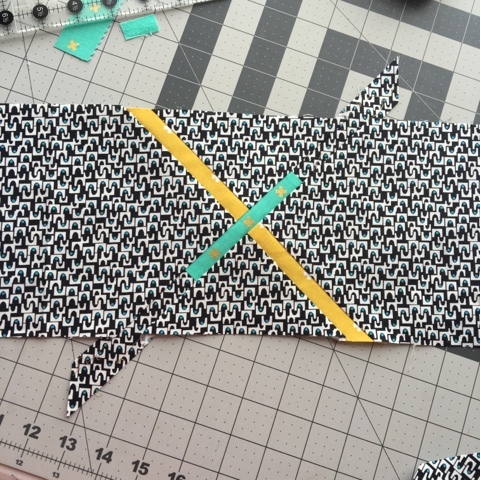 Because I was using 2.5" pre-cuts, I sewed them on and cut the excess off to use in the next step. Since this step differs from the tutorial I made a point of photographing to illustrate this method as another option. 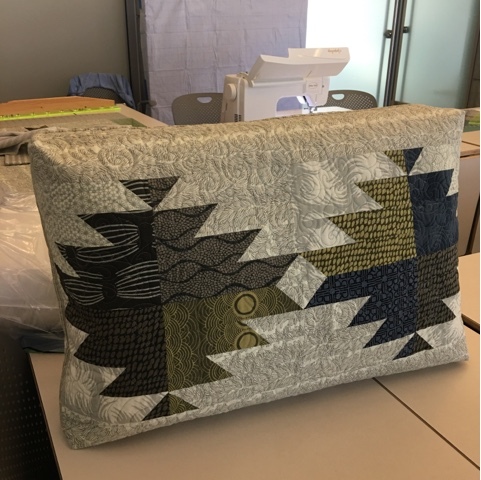 The binding was stitched on just in time for show and tell at the traditional guild I belong to and I brought it to my MQG meeting too. 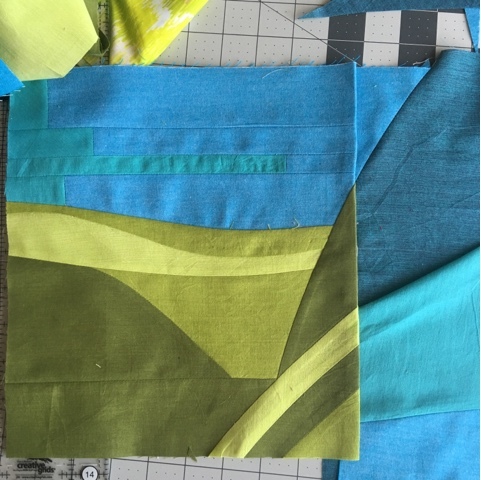 I tried to describe the process of sewing, cutting apart and sewing together but when you put it that way it just sounds like what we all do in quilting right? I needed the "before" version to hold up next to it. Glad it was well received by the group and I got several compliments after. 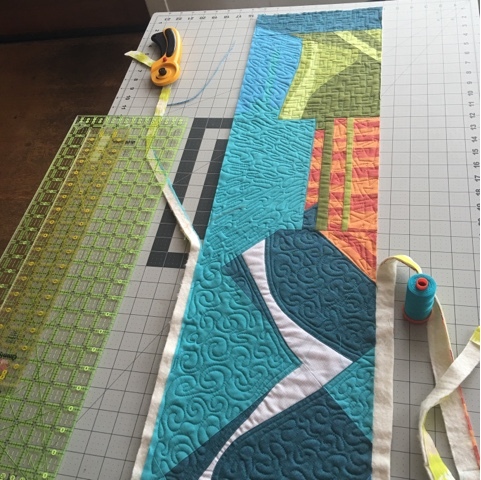 For the quilting, I did an organic gentle wave with several 40 wt Aurifil threads. 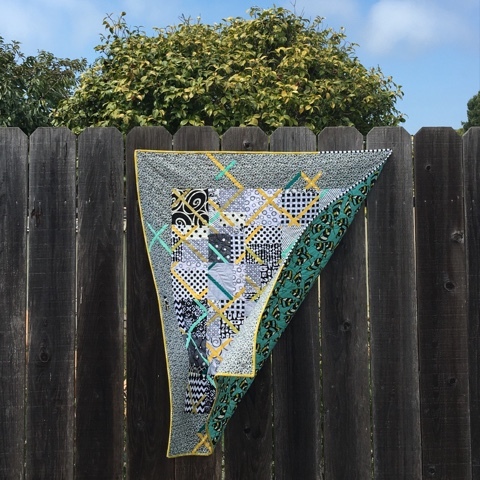 The wind picked up during the photo shoot but I kind of love this shot because it shows off the perfect stash backing. When I gifted the quilt to the expectant parents, I pointed out the "Baby Makes Three" detail. Some projects torture me once the tops are done and it's time to choose the backing and binding because there are so many ways to go. 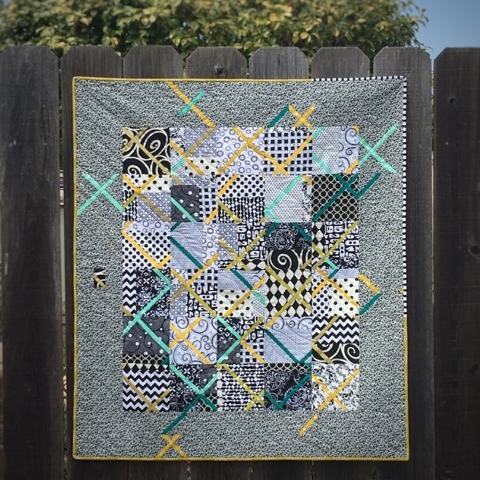 This quilt had a strong voice and took very little auditioning before settling on this combo. 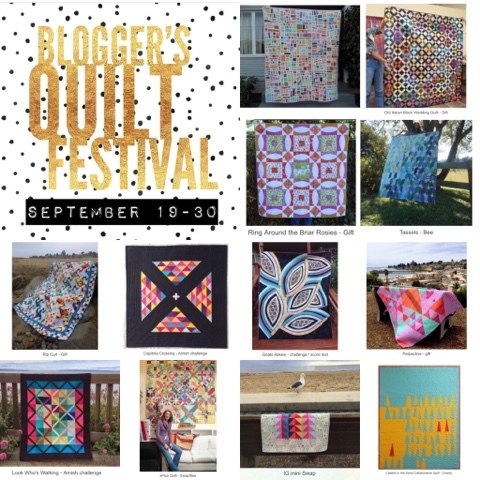 Amy's Creative Side Blogger's Quilt Festival has always been a favorite of mine. Not only is it fun to participate by linking up, it's the perfect inspiration resource. Browse back and visit previous entries from Blogger's you may just now be discovering. I'm certain of one of the quilts that I will choose but unsure what else will add to this list. I'd love to hear from you about your experience with the Festival or about an annual tradition in your town. 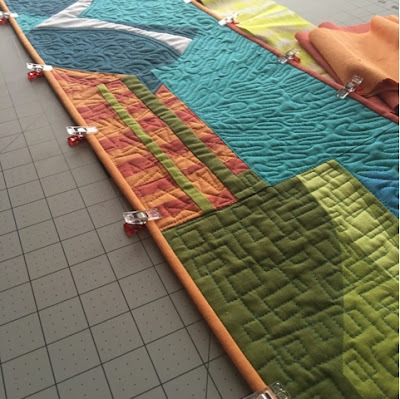 edit: adding my link up for 2016 FAL Q3 for my finished quilt! I'd have to guess that this particular one has made an appearance on more FAL goal lists than any project - ever. This one. 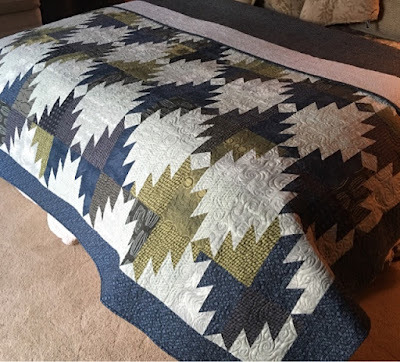 The long overdue quilt for my youngest son is finally finished. He's waited so patiently for it and there really is no excuse why it is late. It's not like subconsciously I didn't want to admit my baby was all grown up, right? 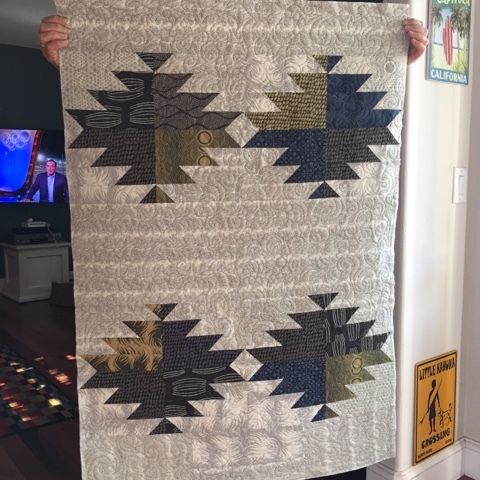 One day I will make a collective collage of all the 21st Birthday quilts I've made for my nieces, nephews and sons but I've got one more to sew before I can do that. 11 out of 12 feels accomplished and considering I was on time for the first 9 of those, well that's something. 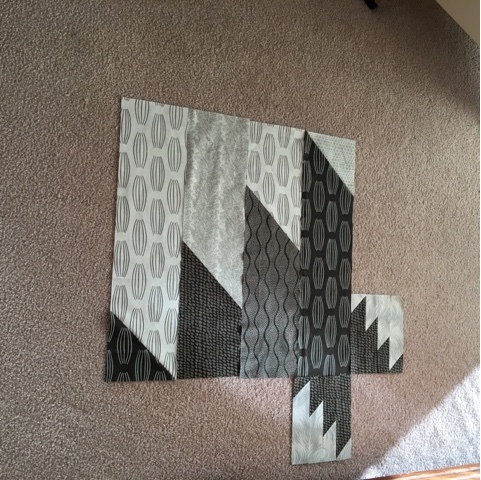 By the time I got the top done I was really tempted to find a 108" wide and call it good. 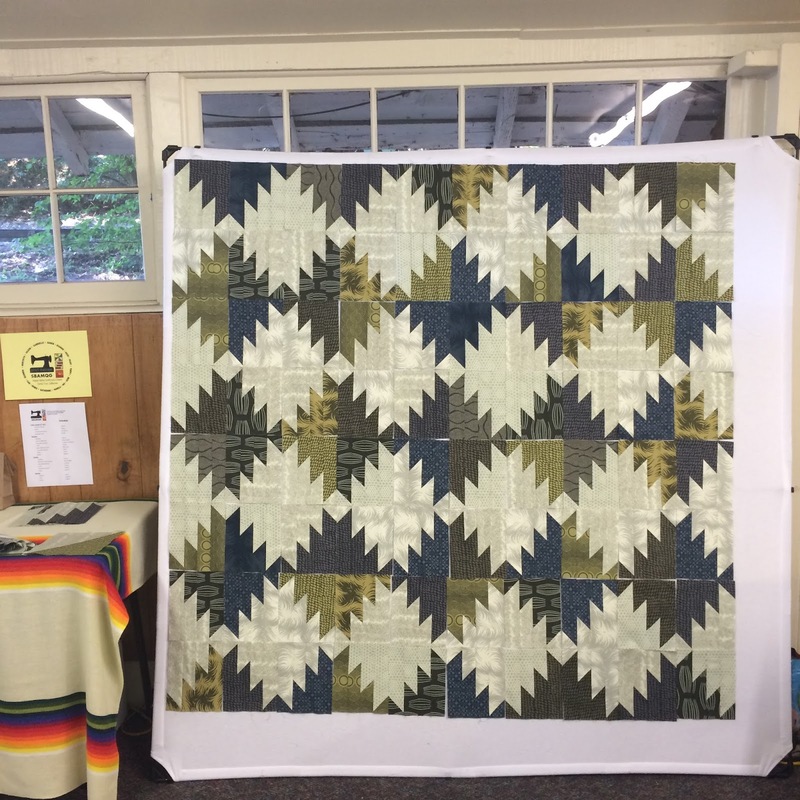 But, you know - it's such a special quilt. So instead pushed myself to create the jumbo version of the block, piecing scraps together as needed. My friend Lori saved me big time with the fabric used in the border so that I could build it out large enough. 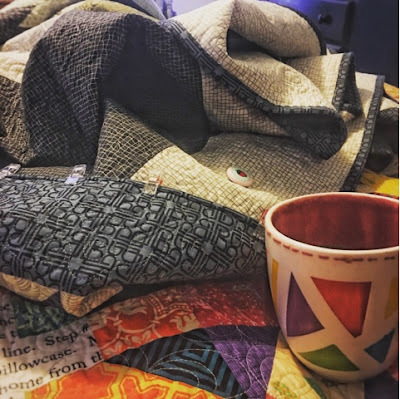 Thanks to wonder clips and a needle minder, I spent the weekend in bed with a marathon binding session stitching down the binding and binge watching Stranger Things and Gilmore Girls. It happened to fall on the first Modern Quilt Guild Virtual Sew Day so that was fun. I was fortunate to use my friend Pat's longarm and although it was quite the learning curve and probably not the best first project to take on considering the size and fussy placement of the back, we had a great time hanging out and it was in the end a big success. 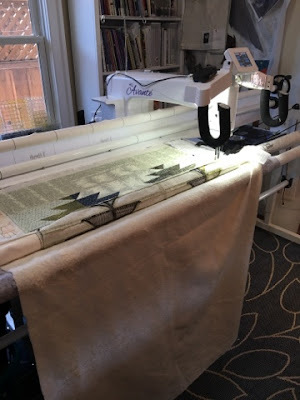 Funny enough I was worried about the light thread contrasting on the dark fabric and although it was intimidating stitching on those blocks, I could see what I was doing much better than then when it blended on the light. Isn't this shot a crack up? With photos unless there is an object to judge it's hard to tell size. 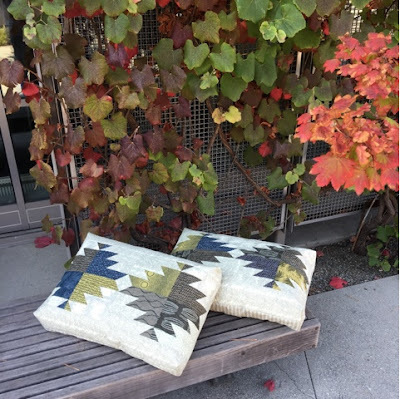 The measurement of the motif determined the width of the shams and the pillows were fortunately close to being the same width. At the suggestion of my friend Anna at our guild Sew Day I boxed the corners for a cleaner fit. 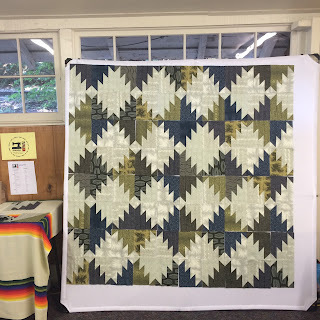 Naming a quilt is something I enjoy - a feeling not shared by everyone apparently - check out Debbie's post and reader comments to see what I mean. Of course it's a delectable mountain because that's the block name, but it deserves a title. 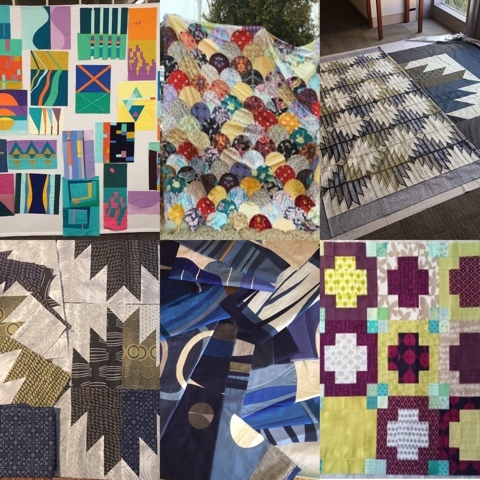 It's been referred to "my Retreat quilt" because I've taken it to every single one over the years. I've also called it my Parson Gray (PG) quilt because although I have a scrappy aesthetic, my son does not and pre-approved each fabric used. So with a play on the initials, I've titled it Parental Guidance. I'm happy to say, he's grown into wonderful young man and I am extremely proud to be his mom. 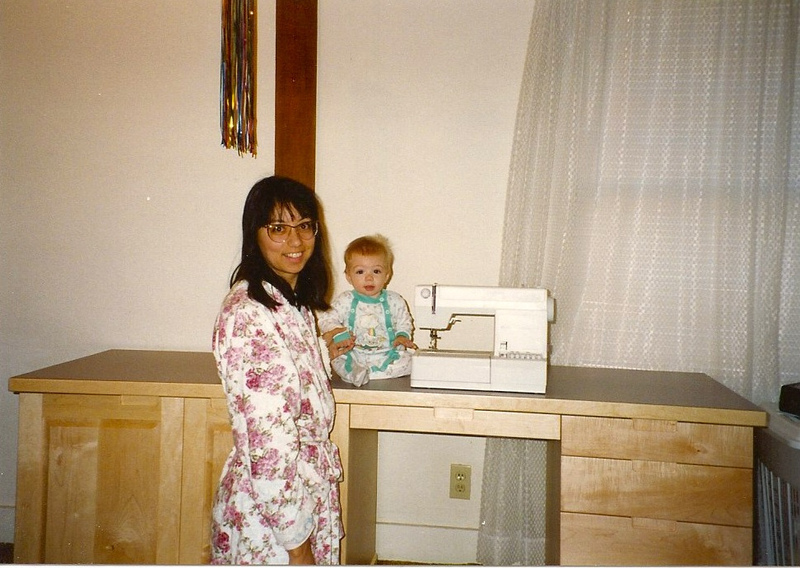 On that note, I'll leave you with this treasured photo from when he was no bigger than my sewing machine. and later on to FALQ3 for the quilt and the shams (2 of my 6 goals) Here's a link to my goals post.